One of the best ways to keep getting traffic for your oldest/earliest posts is to make them search engine friendly. In the long run, only search engines can help you to get traffic from old posts. I run multiple blogs and we have several authors working day and night to keep these sites updated with fresh, quality content. Sometimes, however, quality can drop (which usually happens due to a lack of knowledge). When writing these SEO articles, there are several things that you should keep in mind. Also note that in this post I will not be covering keyword research as keyword research requires a detailed post of its own. All of the most popular SEO plugins allow you to add meta descriptions to a post. These descriptions play a major role in search engine ranking. When naming an image, keep the name relevant to image itself. For example, if you take a screenshot of an AdSense dashboard, and you name the image “AdSense”, it will not be targeted. Instead, you need to use a name like “AdSense-dashboard”. Here at ShoutMeLoud, we use an effective plugin called SEO Friendly Image which uses the image name as its “alt (alternate text) attributes”. This way, when people search for an image at Google Image Search, they will land on an image in one of our blog posts. 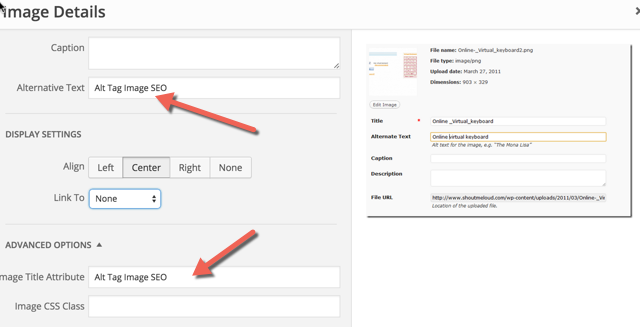 If you choose to not use such a plugin, you can always manually add alt attributes when you upload an image. I have seen positive results when using keywords in image anchor text (when naming an image), so you should at least use keywords in your image alt text. When we write a post, our post titles usually come with lots of stop words. We use the Thesis post styling feature to create the style of our blog posts. Do you know someone who can benefit from the information in this post? Share it with them on Twitter, Facebook, or Google Plus!